Home » Does Not Play Well with Others - "You Can’t Always Express Your Feelings with Puppets"
There is a lot going on in this show and since props feature heavily, let’s start with them. The puppets themselves are for the characters of Oomph and Bae, they are the stars of the show within the show and give Hall and Proulx the chance to showcase their craft of puppeteering. Special note has to be made of Hall’s singing, which is so rich that it really is absurd that anyone could believe it belonged to a puppet. The show also features the role of technology in our everyday lives and how the media cycle plays into public opinion. Never superfluous, all the props used by the show contribute to story, making it a piece about the times we live in right now and how factors like 24-hour news cycles, paparazzi, and constant communication through cell phones contribute to stress. With an absurd premise and comical dialogue, the main story revolves around the pressures these puppeteers face working at a network that is under the microscope of the press. With vulnerability and rawness, Proulx and Hall explore a delicate subject and the different factors that play into handling stress- specifically in a creative field. Are creative people “creative because they are crazy? or are they crazy because they are creative?” A particularly striking moment for me was the different coping mechanisms played out on stage. 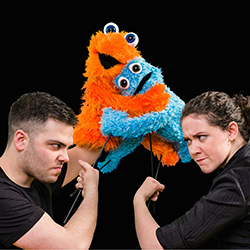 In the same spirit of children’s programs addressing difficult and complex subject to children, this show continues the important conversation about the link between mental health and creativity - with, of course, the help of puppets.